Today's readings are about being called to evangelize. In the first reading, we see Isaiah sees an image of heaven. God is on His throne being worshiped by the many choirs of angels (Seraphim, Cherubim, Thrones etc). They say, "Holy, holy, holy is the Lord of hosts! All the earth is filled with His glory!" Does this sound familiar? It should because we say this at Mass every day before the Eucharistic prayer. It is the hymn of the angels before God. Isaiah is caught up in the magesty he witnessed and feels unworthy. He is a sinner with unclean lips among people of unclean lips. Immediately, a seraphim put an ember ant touched Isaiah's mouth with it removing the uncleanness. God then says, "Whom shall I send? Who will go for us?" Isaiah immediately replies, "Here I am, send me!" At first, Isaiah was reluctant on going to speak for the Lord before the people or sinners. He himself was one of them. However, God prepared Him; cleaned his mouth out, so to speak. Notice how God asks, "Who will go for us." Here we see the mystery of the Trinity; this plurality of persons (us) (Genesis 1:26). Also, we see how God respects man's free will (Sirach 15:11-20). He does not say, "You over there, go now..." rather He asks, "Whom shall I send? Who will go for us?" God asks the same of us today. We must not worry that we are sinners or incapable. It is God who will work through us to do His will (Philippians 2:13). He will give the Holy Spirit to each of us so we can preach the Gospel and sing His praises as we read in today's responsorial Psalm (John 14:16). In the sight of angels we sing God's praises. We give thanks to God with our hearts. God is kind to us, saves us and is always there for us. Even when we feel God is not there, He really is there (Isaiah 41:10). Every day at Mass we say or sing the 'Holy holy holy' before the Lord joined by the angels just like what Isaiah witnessed. With this joy, we must go out into the world and evangelize even if we are not perfect as we read in the second reading. The second reading tells us that we have to preach the Gospel even if we think we are not worthy. It is God who calls us (2 Timothy 1:9). God gives us the gifts necessary to go out and preach the Gospel of Christ (Romans 12:6). Even if we are imperfect - we surely are sinners - we must evangelize because God is the one in charge. God often chooses the weak, the most unlikely of persons to do His will (1 Corinthians 1:27). We have seen things many times in the Bible and in the lives of the saints. Those who were the weakest, those who sinned the most, those who were simply clueless were chosen by God and did many great things in His name. Paul was one of those people. As Saul, he persecuted the Church, yet God chose Him and did many great things. We must never doubt ourselves and what God can do with us when we allowed Him to take control at the helm, so to speak. 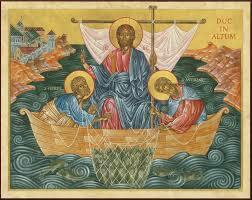 Speaking of nautical terms, we will read in the Gospel how Jesus chooses fishermen. While Jesus was teaching the people, he stood by the Lake of Gennesaret. While there, He saw two boats. One of the boats belonged to Simon which He stepped into. From there, He continued speaking to the crowd. After the people left, He tells people, "Put out into the deep water and lower your nets for a catch." Simon responded, "Master, we have worked hard all night and have caught nothing, but at your command I will lower the nets." When he did this, they caught a great number of fish; so much, that the nets were tearing. Simon then realized that the master was really 'the Master' and told Jesus to depart from him because he was a sinner. Jesus replied, "Do not be afraid; from now on you will be catching men." Here we see a connection to Isaiah in the first reading. Isaiah was astonished at the glory of God (the angels singing, God on the throne), but felt unworthy to do God's will. In the Gospel, we see Simon (who would be named Peter later) say that he too is unworthy because of sin. However, Jesus dismisses that and tells him not to fear and that he will catch men. Here we see that when God calls someone, it is because God has a plan (Isaiah 43:1, Jeremiah 29:11). Even if God chooses someone who is not capable in our eyes to do God's will, when God calls this person, then whatever God planned will happen (Isaiah 14:24). God is God. Jesus is God (John 10:30). If Jesus tells you to do something, you do it. We must not be like Simon who told Jesus that he had tried to catch fish but failed. Simon did not truly grasp whom he was addressing. When Jesus says something, we must do it. If Jesus tells me to stop blogging, doing radio podcasts or using media and by doing so I will bring more to Him, then I will do it. I will not counter by saying that I need to blog with tens of thousands of visitors etc in order to bring others to Him. Jesus is the boss. He is God. God created all that is. Who am I to counter God? When God says something, it will happen. It may not make sense to you or I, but it will happen (1 Corinthians 13:12). This is the power of faith. We are all called to "put out into the deep water." In other words, we must go deep into the world where the darkness still has control and fish for people. Pope Francis has stressed that the Church cannot be closed in on herself. We cannot be just stuck in a parish. We have to go out there and 'fish.' Moreover, we must not become worried if we are not good speakers, do not have theology degrees or are sinners. When God says to do it, we do it. He chooses the weak, the least intelligent etc to shame the geniuses of the world and the strong. The Holy Spirit will do the work through us. We just need to let Him. Jesus chose fishermen, not scribes of the teachers of the law who were more educated. Let us go out there with our nets and cast them out into the deep. May Jesus be praised. Pope Francis Got Pissed Off! Pope: Bite Your Tongue Catholic Gossipers!